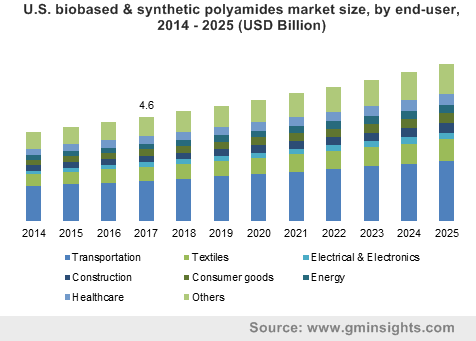 The worldwide synthetic and biobased polyamides market has witnessed remarkable growth in recent years due to the increasing demand for advanced materials in textile, packaging, transportation and healthcare segments. Replacing traditional materials for producing auto parts, aircraft components, medical devices and plastic products with biodegradable alternatives has become a growing trend across the world. Tough, strong, resistant to high temperatures and impacts are some properties endorsing the biobased and synthetic polyamides industry in applications like pipes and coating of printed circuit boards. Awareness regarding the environmental impact of conventional plastics has enormously pushed the adoption of bioplastics further, to promote a low-carbon economy. Extensive use of these polyamides in a range of industry verticals had pushed the synthetic and biobased polyamides market valuation to over USD 30 billion in 2017. Growing investments in research and development of medical devices and apparatus has propelled the biobased and synthetic polyamides industry revenues from the healthcare segment, as engineers and physicians transition from metal to plastic parts. Plastic prosthetic body parts are not only lighter, cost-effective and quicker to produce, they are mostly infection resistant and provide more comfort to the concerned patient. As the world shifts to bioplastics, the medical devices industry will be able to offer patients a more sustainable product that will suit their requirement of artificial limbs or implants. The rising geriatric population worldwide will present vast growth opportunities for prosthetic implant, orthopedics and breathing device manufacturers, which are frequently turning to the synthetic and biobased polyamides market for durable and high-performance materials. According to a 2017 report, including the 1,558 military personnel who lost their limbs in Iraq and Afghanistan wars, there were around 2.1 million people in the U.S. who were living with the loss of limbs, with the number is expected to double by 2050. Further, nearly 185,000 amputations are done every year, indicating the need for making prosthetic body parts available for patients to provide them with improved living conditions. Subsequently, the synthetic and biobased polyamides market will experience a significant surge in demand owing to the increased preference of plastic for making prosthetics that can replace any type of body part. The advent of 3D printing technology across key industry verticals has also benefited the synthetic and biobased polyamides market from the healthcare segment, with growing number of solutions available to print prosthetics and orthopedic devices using plastic materials. In the U.S., prosthetics can cost anywhere around five to fifty thousand dollars, which can be a considerable burden on low income families. Similar costs for electronic and complex artificial limbs can be observed around the world, driving into focus the 3D printed plastic substitutes and creating a lucrative revenue source for the biobased and synthetic polyamides industry. Affordability of 3D printers and the ability to easily design customized parts have made prosthetic components more accessible, including for people in emerging economies. Hands and arms, which are the most commonly produced prosthetics, can be printed and cost only about U.S.$50. 3D printed legs and feet can also be produced at low costs, while innovations in the technology is enabling remora design and printing of the parts. With the rapidly expanding healthcare segment, the biobased and synthetic polyamides industry will also be propagated by the demand for lighter and flexible medical components like breathing masks, tubes and many others. Most of these medical devices are worn by patients for a prolonged period and the reduced weight, enhanced flexibility and complete transparency will help improve functions, in addition to being compliant with regulatory standards. Arkema, for instance, offers Rilsan® MED range of biobased polyamides which help to make devise having high strength, improved mechanical properties and exception resistance to chemicals. They also help the devices to be up to 91% more transparent than glass or polycarbonate based products. Rising expenditure on healthcare services and the availability of low-cost manufacturing processes to make medical devices will significantly propel the global synthetic and biobased polyamides market, which is projected to surpass more than USD 42 billion in remuneration by 2025. Prevalence of diabetes and vascular diseases that lead to loss of limbs will present further growth prospects from the healthcare segment. Major players dominating the overall industry landscape include DowDuPont Inc., Arkema, BASF SE, DSM, Evonik, Asahi Kasei Corporation, UBE INDUSTRIES, LTD. and RTP Company.